This recipe is one of three for oat bars which have recently been published in a promotional leaflet commissioned by Hamlyns of Scotland. I was delighted to be asked to contribute once again following my previous recipe for Spiced Oaty Chicken Goujons. The 'Oat Bars Three Ways' leaflet was launched at Taste of Grampian and will be distributed at shows and events where Hamlyns are exhibiting over the coming months. Keep your eyes peeled and do let me know if you pick up a copy. Hamlyns of Scotland is part of a family food business which started milling oats in 1888. Their traditional range of Oats and Oatmeal is produced from premium Scottish oats, grown and milled in Scotland - 100% Scottish from seed to mill to finished product. Hamlyns work closely with a network of farmers across Scotland, with the majority of their supplier located in the north east of Scotland, near their oat mill at Boyndie in Banffshire, in the heart of Scotland’s oat growing countryside. The mill is still one of the most modern oat processing mills in Europe, combining the latest oat milling techniques with traditional customs. In 2012 the installation of a wind turbine made them the first oat mill in modern times to be fully powered by wind. Preheat your oven to 160c degrees and grease/line a 34cm x 20cm tray bake tin. Melt together the butter, golden caster sugar and honey over a low heat in a good sized pan. Once melted, stir in the Hamlyns porridge oats and oatmeal and mix until well combined. Carefully spread the raspberry jam over the base flapjack - you may find this easier if you give it a good mix or warm it first. Cut the cranachan flapjack into 24 squares whilst still warm, but leave them to fully cool in the tin. To make the whisky icing sieve the icing sugar into a bowl, add the whisky and beat until smooth. The consistency should be that of double cream. Once the icing has set recut the flapjacks and remove them from the baking tin. Hamlyns have recently teamed up with renowned Scottish designer Gillian Kyle to produce a range of branded merchandise. These items are not available to puchase however readers of Foodie Quine have the chance to win a bundle of Hamlyns breakfast goodies which include them. 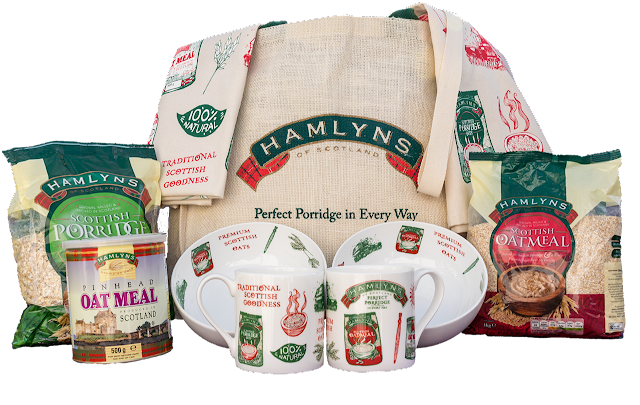 The prize worth £70 consists of 2 x Porridge Bowls, 2 x Mugs, tea towel, apron, spurtle, tote bag, oats and oatmeal. To be in with a chance of winning the Hamlyns prize bundle enter via the rafflecopter widget below. Giveaway ends 30th June 2018 11.59pm Good Luck! Disclosure: This is a commissioned post for Hamlyns. As always, all views expressed are my own. Thank you for supporting the brands who make it possible for me as a passionate Scottish Food Blogger to continue to share my Edible Food and Travel Adventures with you. I’m super choosy who I work with and promise to bring you only the cream of the crop. For someone who says they don't have a sweet tooth, you have an uncanny knack for making things that I'm desperate to eat as soon as I see them on your blog. I adore flapjacks and cranachan and this is a brilliant take on two of Scotland's famous sweet treats. 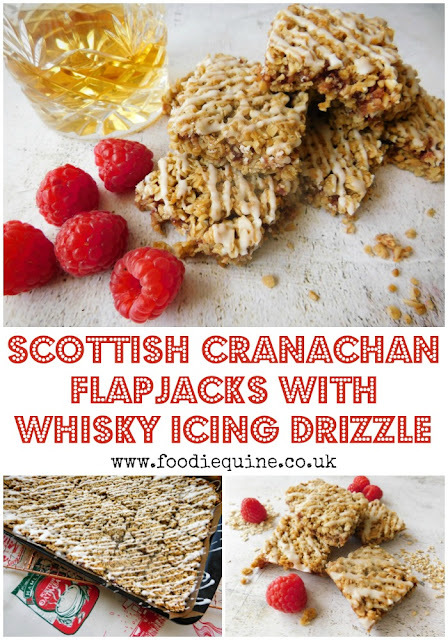 You had me at flapjack but then I saw the whisky icing drizzle... 😍😍😍 fab recipe and love that youve stuck with traditional scottish products too! Good luck to everyone entering! Whisky icing? That's a fun way to liven up flapjacks as an afternoon snack! Great way to combine 2 recipes in one. I love a flapjack and cranachan too! Only a tablespoonful in the whole recipe so not enough to get you drunk. Just a wee drizzle of extra Scottish-ness on the top!